CPSP is pleased to announce the initiation of Advance Cardiac Life Support Program at CPSP, initially at Karachi. The Program has been acquired from American Heart Association and has accreditation from American Heart Association. Advanced Cardiac Life Support program has been developed by the American Heart Association (AHA) to enhance the skills of the attending doctors in emergencies, treating the victims of cardiac arrest or other cardiopulmonary diseases. It helps to recognize ventricular fibrillation and other life threatening arrhythmias so as to enable to plan adequate treatment strategies. ACLS is based on simulated clinical scenario that encourages active, hands-on participation through learning stations where trainees practice essential skills individually, as part of a team and as team leader with the help of ACLS algorithms. PWW Management of Primary and Secondary Airway. Technology Review to learn the difference between Defibrillation and Cardioversion. Video based Recognition of S/S and management of Acute Coronary Syndrome. Recognition of S/S and management of Acute Ischemic Stroke through video. Putting it all together for learning management of one arrhythmia changing to the other. ACLS provider manual needs to be comprehended before participation in the course. A candidate who has not received his manual at least couple of days prior to the course is recommended to wait for the next course. The candidate must solve the pretest assessment preferably at home before attempting the course. Dressing during the course should be comfortable for the practice at the skills stations. The course is designed primarily for general physicians, family healthcare providers, nurses, emergency medical technicians, paramedics, respiratory therapists, and other professionals who either direct or participate in the resuscitation of a patient, at the pre-emergencies, emergencies or in of hospital. ACLS Course is of 13½ hours duration spread over onto two days which includes breaks. 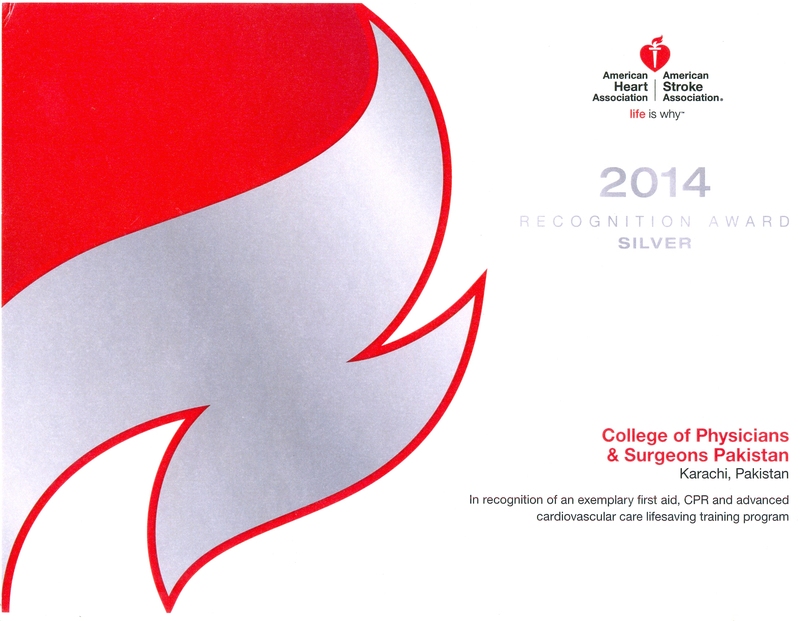 American Heart Association completion card & also acknowledgement from CPSP. Address : BLS/ACLS TC.Faculty and Course Director 34-B, Model Town Lahore, Pakistan. Address : Acting Incharge BLS/ACLS Department, Karachi. Pakistan.